Happy spring!! Tomorrow will be a whopping 32 degrees. Blergggg. But that’s kinda how every March is, right?? It always blows my mind that spring starts in March because for this New England girl, March just brings thoughts of cold and snow. This afternoon, I actually heard a lady on the train say, “how is it 50 degrees in the middle of winter? ?” I wanted to be like, “hiiii, it’s spring.” But even I was having trouble believing it, so I just kept my thoughts to myself (also, this is Boston and we don’t generally talk to strangers on the train). And yes, it was 50 degrees this afternoon, but tomorrow’s high will be 32. And it looks like it could snow this weekend. So, whatever. Spring Shming. Talk to me again in June. Or maybe July. The other thing that’s making it tough for me to believe in spring? The fact that everyone and their mother is sick right now. Legit, people are dropping like flies at my office and I’m constantly fighting that “omg I’m totally getting sick feeling.” I feel pretty OK right now, but am convinced that’s not going to last. But come on, I can’t have gone through the whole winter not getting sick only to get sick in spring, right?? What I’m really trying to say is… It may be spring, but in many parts of the country, we’re still in winter mode. While there’s lots of doom and gloom about that, there are also plenty of bright spots. Like the fact that we can still cozy up to a beautiful roast chicken. 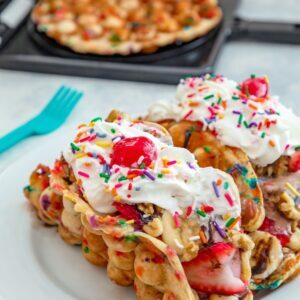 And we can still indulge in sweet potatoes, brussels sprouts, and cranberries… Though sweet strawberries and rhubarb are on the horizon, too. The best of both worlds! In case you can’t tell, I’ve been super into the jalapeño and lime flavor combination lately. I could literally eat jalapeño lime-flavored everything and am so glad it translates beautifully from winter to spring. I slathered this chicken in a buttery jalapeño lime garlic mixture and roasted it to perfection. Roasting chicken is pretty much always a Sunday evening activity for me. 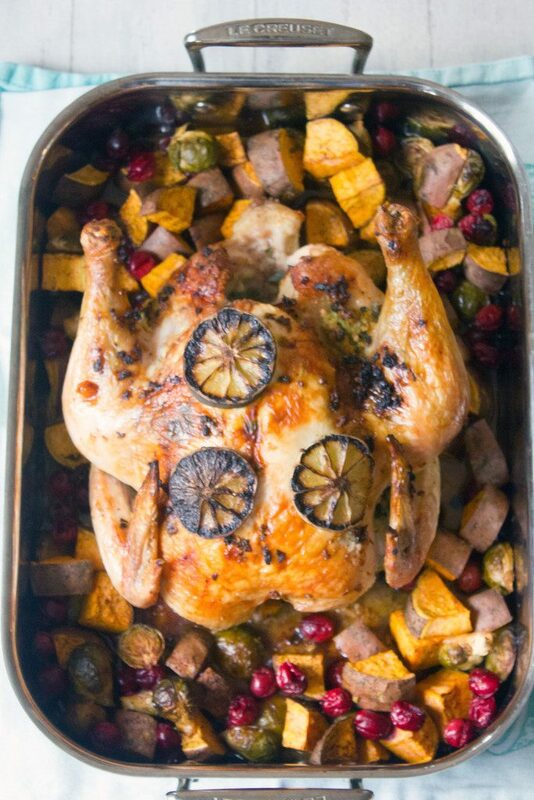 I don’t have enough time to make it on the weeknights and I feel like there’s just something so “Sunday dinner” about a chicken roasting in the oven. There’s SO much you can do to switch things up, but I’m obviously highly recommending this jalapeño lime version. And while you can use any vegetable combination you desire, I say you should use sweet potatoes, brussels sprouts, and cranberries while you can. I think we’re all ready for winter to be over, but there are certainly a few things we’ll miss. 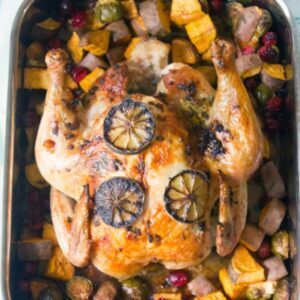 You’ll want to roast this chicken for about an hour and a half and your kitchen will start to smell ridiculously good while it’s in the oven. And it will get all golden and crispy. AKA heaven. One thing I majorly need practice on? Carving chicken (same goes for turkey). I don’t know why it’s so freaking difficult for me, but it just doesn’t come easy. I did a decent job on this one, but I’m sure I didn’t look pretty while I was doing it. This is the ultimate cozy comfort dish. You can have all your spring dishes for now… As long as it’s March, I’ll be indulging in weather-appropriate dishes. Not that I won’t be eating roast chicken all summer long. And sweet potatoes… I’d never turn down a sweet potato. I’m also declaring this meal the perfect flu fighter, so you don’t catch that thing that everyone else seems to have. 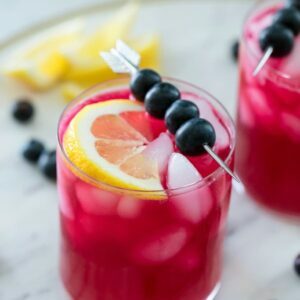 The jalapeños will help clear you out while the lime offers plenty of vitamin C. Plus, think about all those antioxidants in the cranberries, sweet potatoes, and brussels? I’m just watching out for all of you! Does it feel like spring in your neck of the woods? What are you feasting on? 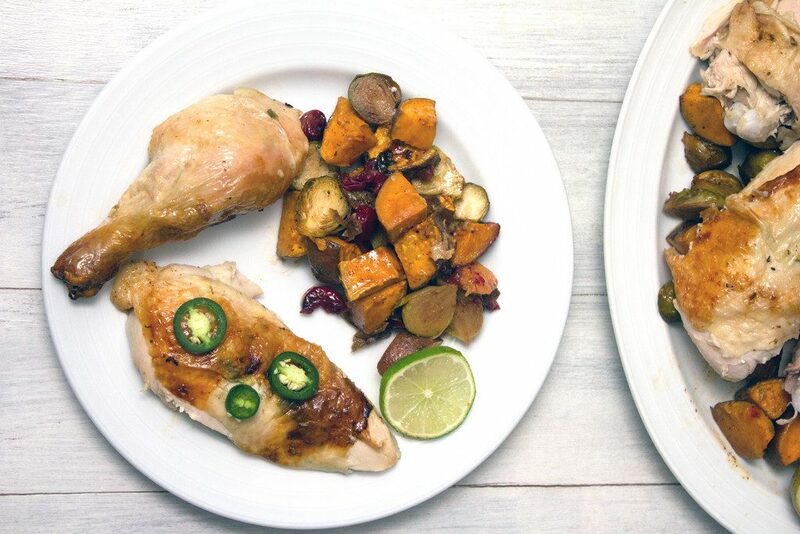 Roast chicken is the perfect comfort food no matter the time of year and this jalapeño lime version will brighten your evening and help get rid of the Sunday scaries. Remove giblets from chicken and pat dry with paper towels. 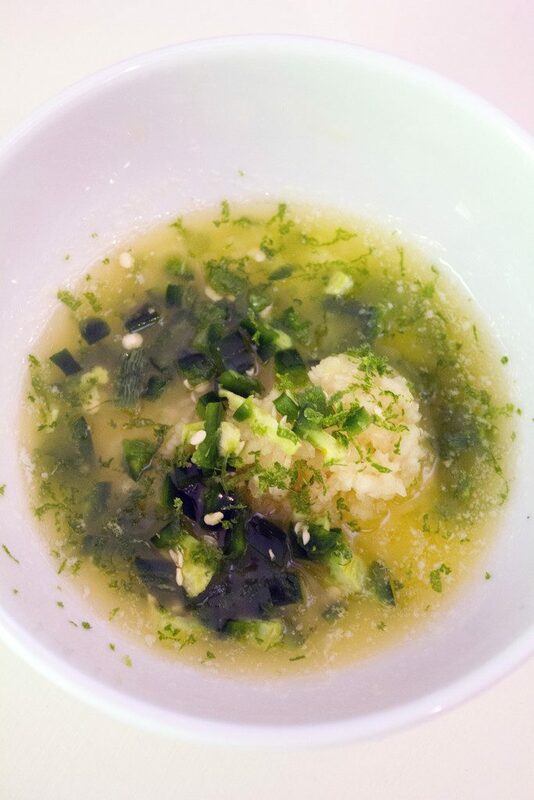 In a small bowl, stir together melted butter, minced garlic, diced jalapeño pepper, lime zest, and lime juice. Rub the chicken with the butter mixture, making sure to get under the skin and in the chicken cavity. Slice one lime into quarters and place in the chicken cavity. Place chicken in roasting pan breast side-up. Tuck wings behind back and tie legs with string if desired. Slice remaining lime into thin slices and place on top of chicken. Place sweet potatoes, brussels sprouts, and cranberries in a bowl and toss with olive oil, chili powder, and salt and pepper. 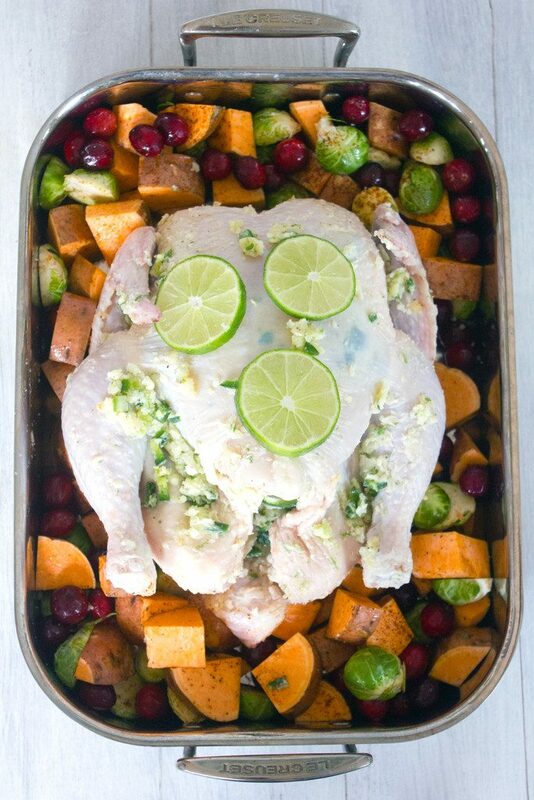 Put vegetables in roasting pan around chicken. Roast at 400 degrees for about one and a half hours, until thermometer inserted into the thickest part of the thigh registers at 165 degrees. Remove chicken from pan and let rest on cutting board for about 10 minutes before carving. 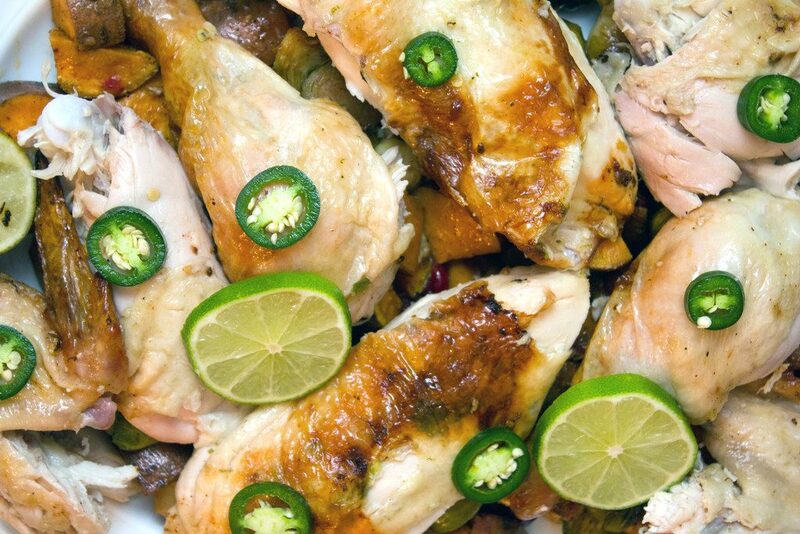 12 Responses to "Jalapeño Lime Roast Chicken"
Happy spring, Sues! It’s going to be cold here today, but 70 on Friday. Crazy! I’m definitely ready for spring, especially with dishes like this roast chicken. It looks gorgeous! I love the jalapeno lime flavors! We’ve been sooo back and forth here weather wise – but I guess that is such a typical thing for March!! And this chicken! Love the jalapeno lime twist! 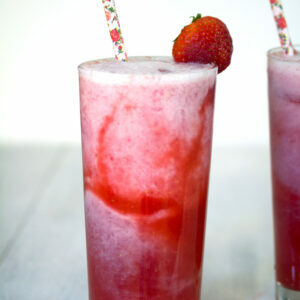 This looks so good Sues. I had a giggle as your 32 yesterday must have been Fahrenheit whereas ours was the same but in Celsius. It’s meant to be autumn but we are still in heat wave mode. Hope you don’t get sick. 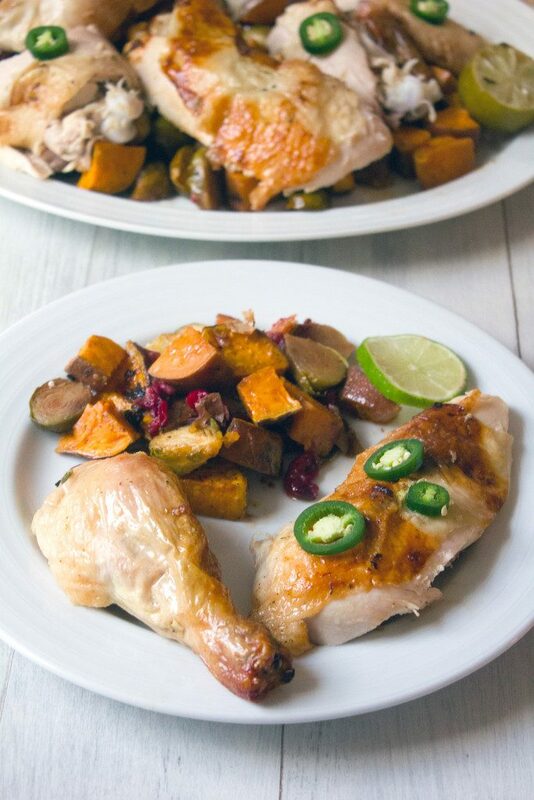 Your flu fighter chicken looks wonderful and I like the idea of the jalapeño lime flavors with the veggies that you used…something different. Mother nature needs to move a little quicker with spring! Love this chicken and all the flavors it has with it! what great flavors for a roasted chicken! i hope it warms up in your area soon! This roast chicken looks wonderful! I love all the roasted veggies too! I hope your weather warms up and you stay healthy! Yay for spring and this flu fighter chicken. It’s gorgeous! 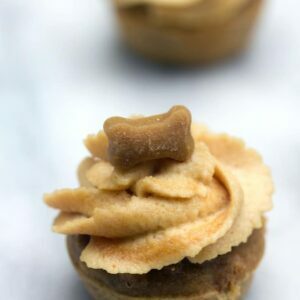 Omg, everyone in our house has been sick on and off for the last two months so I can totally use this recipe! It looks perfect! !